Chennai: Actor Ajith Kumar&apos;s forthcoming spy thriller "Vivegam", with its international standards, will make Tamil filmdom proud, says its art director Milan. "Working on &apos;Vivegam&apos; was an incredible experience in every way. The script and the scale were much higher and different than anything we have seen before. Being grand is one thing and being international is another thing. But &apos;Vivegam&apos; is both. 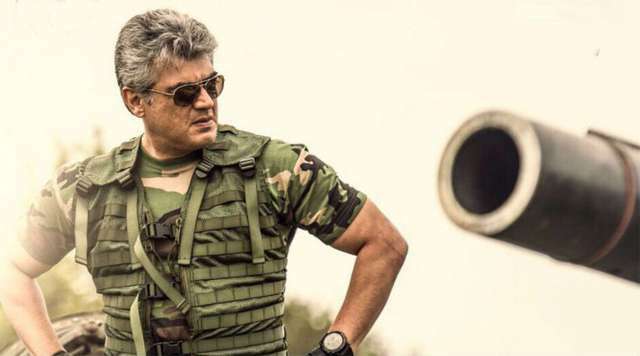 Tamil cinema will be proud of &apos;Vivegam&apos;," Milan said in a statement. Shot extensively in Europe, the film&apos;s shooting took place in locations where human sightings is rare. "Shooting in the freezing weather was tough to handle but the team pulled it off amazingly. I have followed a specific design pattern for this script which requires an international touch.AI believe the visuals have lived up to our expectations," he said. The film, directed by Siva, features Ajith in the role of an international spy. Heaping praise on his hero&apos;s commitment, Milan added: "It was a pure joy and honour to work with him. One can never stop learning from him. "Director Siva gave me ample support and freedom in exploring many artistic aspects of art direction. It opened up new avenues for me. His vision and efforts for the film has been unbelievable." Also starring Kajal Aggarwal and Akshara, the film is due for release on Thursday.